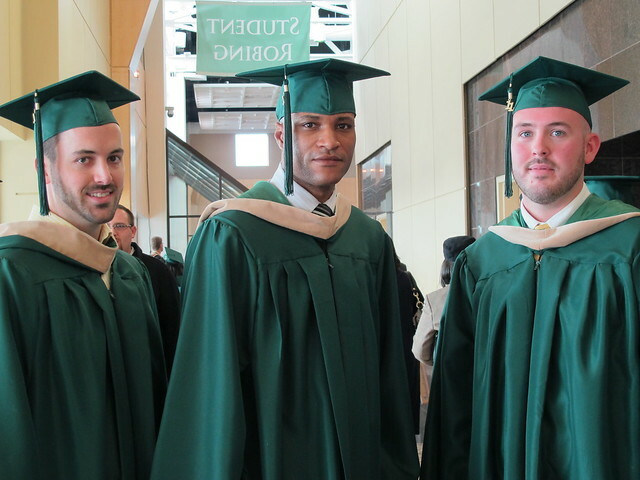 The Chase Center on Wilmington's Riverfront was a buzz Sunday morning, January 30, as students from Wilmington University prepared for the 40th Annual Commencement Ceremonies. The University honored 1,450 graduates and bestowed degrees ranging from Associate’s to Doctoral. This year, commencement was divided into three separate ceremonies: the first honored graduates of the College of Arts and Sciences and the College of Education, the next honored graduates of the College of Behavioral Science and the College of Technology, and lastly graduates of the College of Health Professions and the College of Business were honored. Family members and friends clutched balloons, teddy bears and flowers and cheered as the graduates took to the stage. Others watched the ceremonies from afar by logging on to a live webcast of the ceremony via Livestream.com. 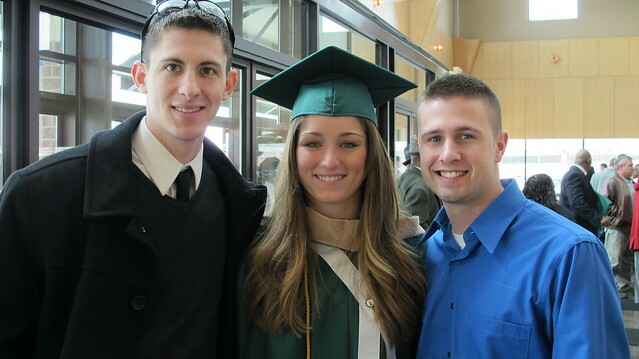 Three students were chosen to be commencement speakers at the Ceremonies. Legal Studies major, Deborah L. Krett, Nursing major, Irene E. Whaley and Administration of Human Services major, Jamee E. Boone all gave inspiring speeches to their fellow graduates. Boone, who works at United Way of Delaware, encouraged her classmates to never give up. "Don't be afraid to go through the fire because history has taught us that great miracles can occur in the midst of the fiery furnace," exclaimed Boone in a passionate speech. "Never give up when things get tough," she went on, "remember life is a marathon and not a sprint and the race is not given to the swift." Fellow Administration of Human Services graduate, Letisha Bowers, knows first hand that perseverance pays off. "I would like to be employed helping those with disabilities achieve independence," stated Bowers, who has overcome disabilities of her own. "There are many barriers to employment for people with disabilities and I would like to help people realize that there are resources out there." Elementary and Secondary School Counseling graduate, Adam Coleman, also shared his hopes for the future. "Personally, I am looking forward to becoming a school counselor. I feel fantastic today! Everyone at Wilmington University is so friendly and the classes are so convenient." Graduate Angela Amato, who graduated with a Bachelor of Science in Media Design - Multimedia was excited yet nervous on graduation day. "I'm graduating early," she admitted. "I decided to make college my priority, so I took five to six classes a block and went full time." She says she enjoyed meeting creative people and furthering her education. "I hope to keep going in my creative field. Maybe as a graphic designer or a web designer." Several dignitaries attended Sunday's ceremonies. Delaware Senator Tom Carper made a surprise appearance at the University's 10:00 a.m. ceremony. He was in attendance to support employee Laura Wisler who works as State Scheduler in his Wilmington Office. Wisler earned her Bachelor of Science degree in Business Management. Later in the day, Maryland Congressman and former House Majority Leader, Steny Hoyer, attended the Riverfront Ceremony to celebrate the achievements of his daughter, Stefany Hoyer Hemmer, who graduated with a Master of Science in Nursing. Thanks to the wonders of modern technology people from across the globe were able to watch and chat about the Wilmington University Commencement Ceremonies. The University updated frequently via the social network, Twitter and streamed the entire ceremony live on Livestream.com. "My wife will be graduating from Wilmington University today! I am so proud of her!" Tweeted Dover resident, Elbert Collins. "So proud of our niece Shareeda Danielle Cook. Thank you for allowing us to watch this auspicious occasion all the way from Duncanville, Texas," wrote Titi Leida while watching on Livestream. Wilmington University honored several notable graduates with Academic Awards. See a full list of Academic Award winners below.The Trustee's Award for Service, presented to a graduate for outstanding service to fellow students, Wilmington University, or the community, was awarded to Julie Gravatt (Bachelor of Science in Elementary Education) who has worked tirelessly in the community including efforts to raise awareness about domestic violence. The second Trustee's Award was presented to Rendell Bradley (Master of Science in Organizational Leadership) for commitment to creating a healthy Delaware through promoting healthy lifestyles. The Audrey K. Doberstein Award for Leadership was presented to Ann Norman (Doctor of Education) for her dedication to improving library services throughout the state. The second Audrey K. Doberstein Award was presented to Paula Evans (Bachelor of Science in Nursing) for being a leader in the field of health care and an advocate for best practices in patient care. University President, Dr. Jack Varsalona, thanked the graduates for choosing Wilmington University and wished each graduate happiness and success in the future. "The University is proud of you and remember you will always be a cherished member of the Wilmington University family," said Dr. Varsalona. To watch the ceremonies visit www.livestream.com/wilmu. 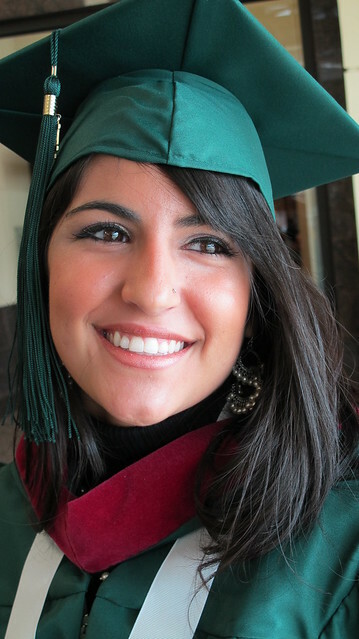 Graduate Angela Amato received a Bachelor of Science in Media Design- Multimedia. Marie Hock celebrated with family and friends.